A hundred years ago today, on the 11th of November 1918, the Armistice of the First World War went into effect, ending 4 years of the most brutal, deadly and exhaustive wars the world had yet seen. It meant the end of fighting and hostilities between the Allied Forces and the German Empire, even though it would take half a year until a peace treaty was signed at Versailles in June 1919. Even though that peace treaty would eventually turn out to be the starting point for a period of turmoil for Europe, culminating in an even greater war, it behoves us to remember the Armistice that ended the horror of World War I combat. And of course, at Frameland we do so by celebrating a handful of the best and/or most interesting films about the First World War, with films from several continents ranging from 1930 to 2011. ‘I just needed to get away from the cannons.’ With these words, private Hamp (Tom Courtenay) tries to explain his desertion from Passchendaele. Although in his mind it wasn’t a desertion, at least not consciously. He just couldn’t take it anymore; the trenches, the death of his mates, and those cannons that wouldn’t stop shooting. So he started walking. 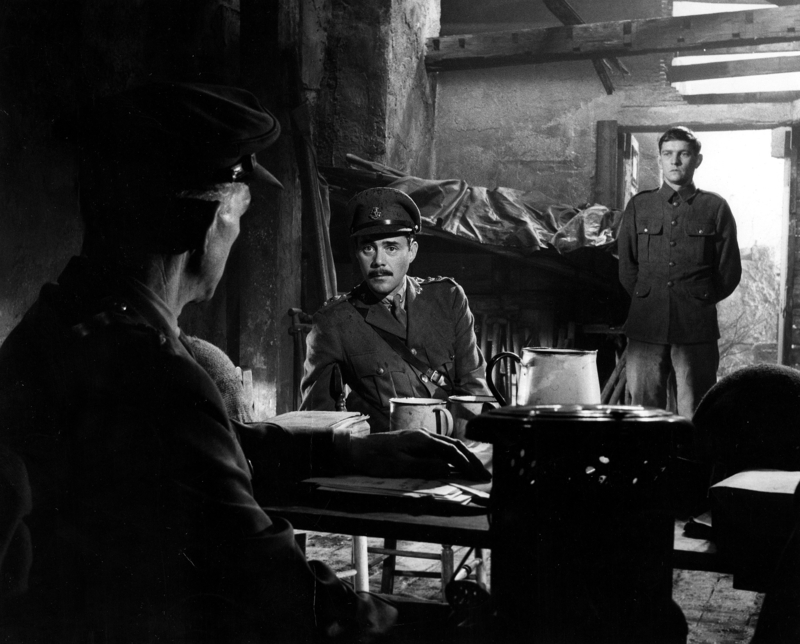 Joseph Losey’s King and Country, based on a play by John Wilson and a novel by James Lansdale Hodson, is a powerful indictment of war. When Hargreaves (Dirk Bogarde), an officer appointed to defend Hamp, first meets him, he is not impressed. Hamp isn’t particularly bright or well-spoken. But he is disarmingly honest. And over time it is precisely Hamp’s boyish naivety that makes Hargreaves defend his case with vigour. Both Bogarde and Courtenay are outstanding in showing how some form of understanding grows between the two, even though their worlds never truly meet. While the rain outside is constantly pouring, Hamp is brought before an improvised court-martial. Within that single location, Losey experiments with the way he places characters in the frame, often times not opposite one another, but facing the same direction. As if layering the meaning of the frame. Hargreaves pleads to the court to take into account what Hamp has seen and lived through in the muddy trenches. But to the court, Hamp’s story is not important. He’s just a cog in the machine and the machine needs to keep turning. A photographer takes a picture of European rulers. He gives the Archduke Ferdinand of Austria and his wife, the Duchess of Hohenberg two red poppies. The flash goes off and the archduke and the duchess fall down. They are assassinated. World War I has started. Oh! What a Lovely War, based on the 1963 stage musical, was Richard Attenborough’s directional debut. The film not only summarises the four years of war but also comments on the events, mainly through satirical songs (which were actually popular songs back then). This music makes the scenes on the front feel hopeful. It gives us an idea of how the soldiers tried to keep their head up during the battles. The film switches between a happy fantasy location, a kind of fair, at the Brighton’s West Pier and the harsh reality. The British family Smith has a nice time at the fair. However, one by one, the men of the family are recruited for the army. They step in a small train and sing, while the fairground attraction drives away from their wives, who wave their husbands goodbye. A cut brings us back to a real, empty, station, where one of the women stands alone, not knowing if she will ever see her lover again. Because of the settings and the songs, Oh! What a Lovely War is quite a light-hearted film about the First World War. But that doesn’t make the film actually funny. It still remains a film about many white crosses in a cemetery and remembrance poppies. A scathing indictment of blind ambition, arrogance and the arbitrary loss of human life, this adaptation of Humphrey Cobb’s eponymous WWI novel (1935) by director Stanley Kubrick is one of the fiercest (and finest) anti-war statements ever made. France, 1916. In order to secure a coveted promotion, General Paul Mireau orders an all-out attack on a heavily fortified German position. However, the soldiers are not even able to leave their trenches, let alone advance. Afterwards, Mireau blames his troops for the failure instead of recognizing his own lack of sound strategic judgement. To restore discipline among the troops, a court-martial is installed, and Corporal Paris, Private Arnaud, and Private Ferol are the unfortunate scapegoats to be tried, while Colonel Dax acts as their defence counsel. He proves ineffective against the prejudice and obtuseness of the military court – the men are sentenced to die by firing squad. After the execution, General Mireau is exposed and left to face a military inquiry and disgrace. Bewildered and furious, Dax is then offered Mireau’s position. 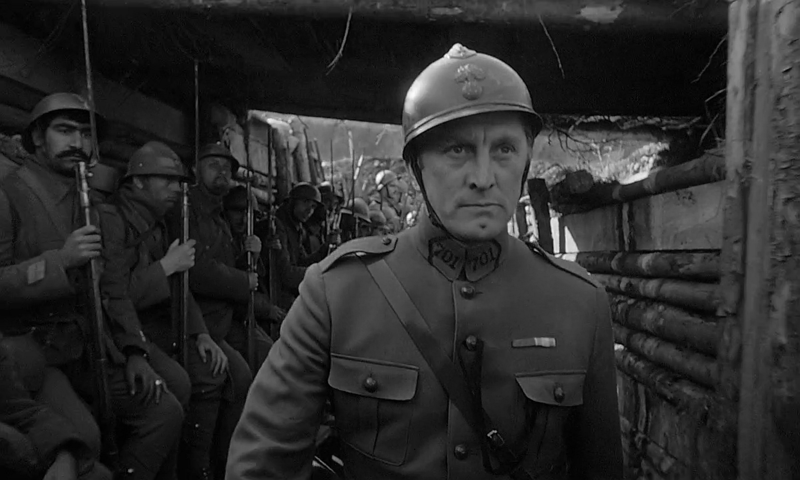 Aided by Georg Krause’s excellent monochrome cinematography, lending an air of fluidity to the battle-scenes and grandeur to the palatial surroundings where the betrayal of common soldiers is daily routine, Kubrick’s Paths of Glory ranks among his very best films. The cast is outstanding – and especially Douglas delivers a career-defining performance. The excellent script exposes the dirty machinations of war among its most senior commanders, while never selling short the plight of ordinary soldiers. 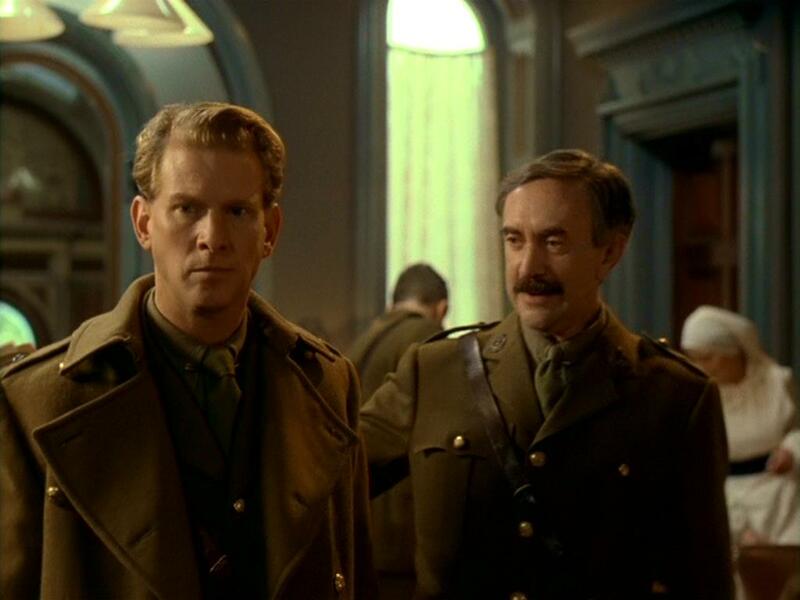 It’s a curious situation that Captain William Rivers (Jonathan Pryce) is involved in: in his Craiglockhart hospital near Edinburgh, he treats WWI soldiers suffering from emotional ailments due to shell shock. After being cured, they are sent off to war again, most likely to be killed. In this ambivalent setting wartime poets, Lieutenant Siegfried Sassoon (James Wilby) and Lieutenant Wilfred Owen (Stuart Bunce) meet and create some of their finest work, fiercely and eloquently denouncing the horrors of war. Lieutenant Billy Prior (Jonny Lee Miller), also a patient at Rivers’ clinic, suffers from a speech impediment since he was traumatised by a horrific event in the trenches. Rivers’ unorthodox healing methods ultimately help the three men recover their lost humanity and their voice – both literally in Priors case, and metaphorically in the therapeutic collaboration and friendship between Sassoon and Owen. Based on Pat Barkers’ novel Regeneration (1991), director Gillies MacKinnon eponymous film (US title: Behind the Lines) carries a sombre, elegiac tone. 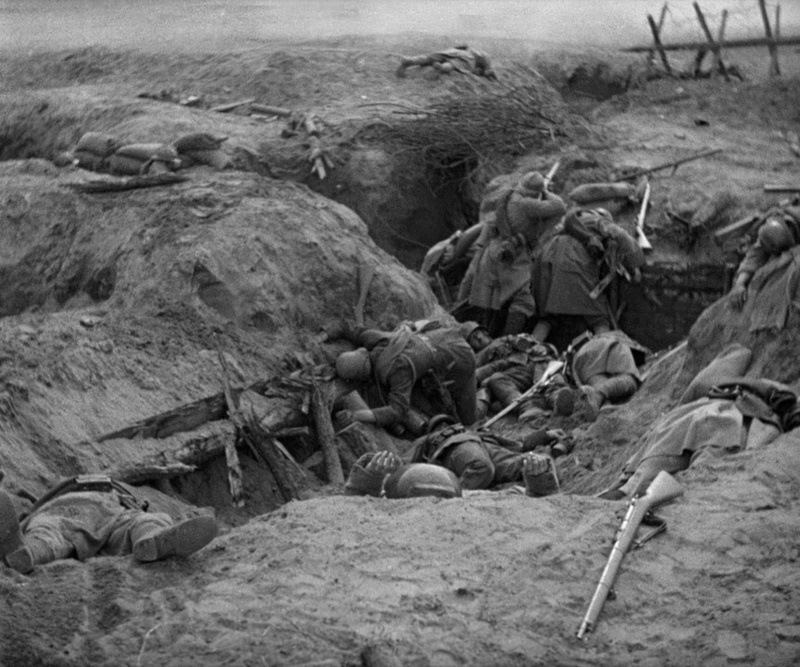 That said, in pointing out the basic absurdity of healing men, only to drop them again in the meatgrinder of WWI, MacKinnon’s film conveys a very palpable sense of anger and sadness. Aided by Glen MacPherson’s superb cinematography, and by stellar performances, most notably by Wilby and Bunce as Sassoon and Owen respectively, Regeneration is both masterful and restrained. 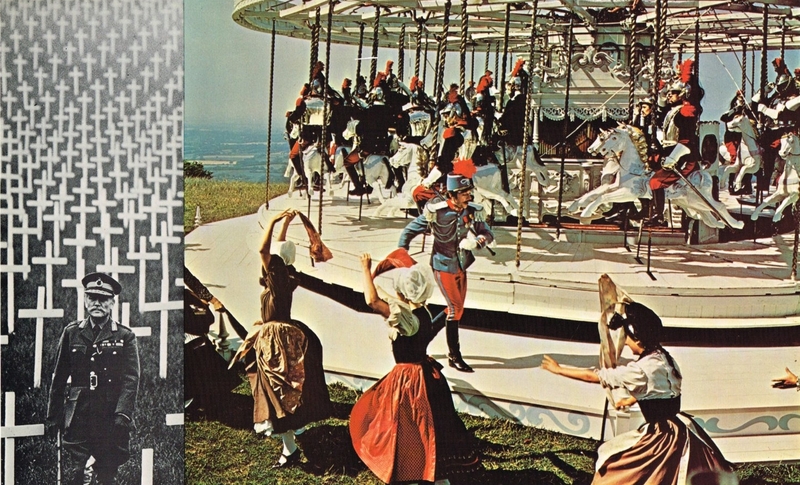 Ideas of masculinity and the infallibility of the courage of men are such mainstays of war films that when a film like Jean-Pierre Jeunet’s A Very Long Engagement comes by, we are forced to rethink the contexts within which we view wars and suffering. Based on a novel by Sebastien Japrisot, the film’s male protagonist Manech (Gaspard Ulliel) is a soldier drafted in WWI but he is not the shouting, growling male stereotype of a soldier we are used to. He wounds himself hoping to be sent back home, but his trick is discovered. Through Manech, Jeunet redraws the age-old lines that we often draw when speaking of heroism, bravery, and cowardice. He looks beyond the jingoism of the war, which carries on in the cold and dark trenches, and in a Wilfred Owen-way, looks at the human being beyond the uniform and brings forth the humanity that suffers the most during wartime. Manech’s lover, Mathilde (the formidable Audrey Tautou fresh from the whimsical energy of Amelie), walks around with a polio limp as she goes searching for Manech, thereby exposing the corruption and double standards prevalent in the French wartime bureaucracy. While portraying the romance of A Very Long Engagement with his stunning and breathtaking visuals, Jeunet does not lose sight of the utter horror of war. He balances these with the prowess he balances the storytelling of war-torn story that is both universal and deeply personal. Steven Spielberg doesn’t often visibly steal from other filmmakers, so when he does there’s a mighty good reason. When he first arrived in Hollywood he found John Ford in his office and asked him for advice on how to be a great director. Ford pointed to a painting of a horizon on the wall and very clearly denoted where it fell. “See this? 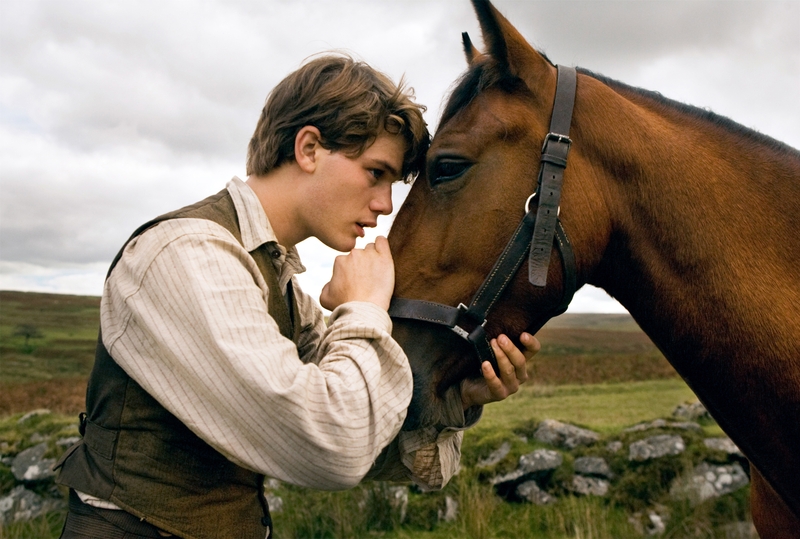 The horizon is never in the middle of the picture.” And here in War Horse we see Spielberg reliving this meeting, productively aping John Ford and his love of horse-drawn stories of men discovering reserves of courage they didn’t know swam in their veins. Everyone in this story is heroic, if only for a minute. Warfare is presented as a series of gunshots and explosions rending the sky and disturbing natural peace, the thing that stains the hopeful eyes of sad dreamers, none of whom will live to be their best selves. Their courage before death will have to do. The ways they all tried their best in the face of slaughter and hopelessness. Spielberg gifts them with Ford’s version of dignity and creates one of his best and most frequently dismissed films. Anything this earnest in the face of death and defeat always demands more of an audience than the most cynical are willing to give. Like much in the movie, it may look like courage, but it’s a deflection from our own emotional response. It’s ok to cry for a horse, or because the sunset is just right, even if there are more dead than could ever be tears. 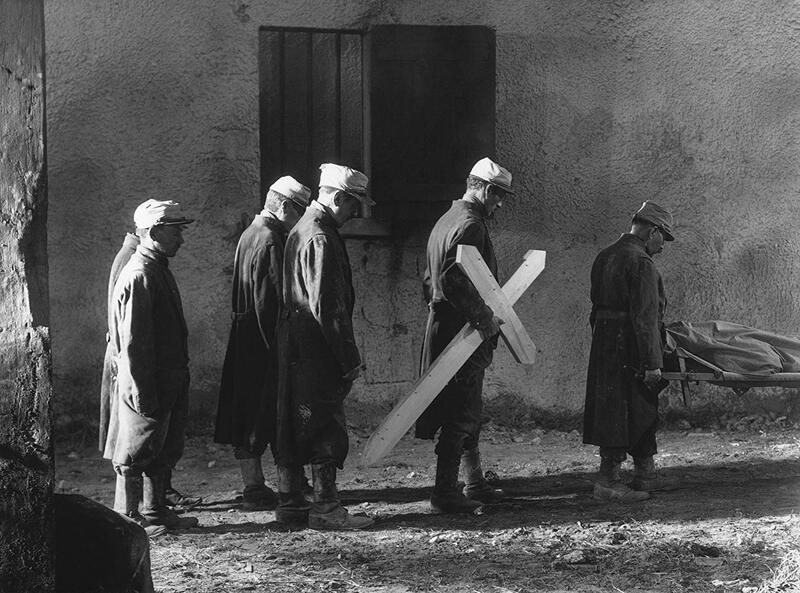 Raymond Bernard’s 1932 Wooden Crosses is a devastatingly bleak look at life in the trenches, built around a series of increasingly harrowing and bloody set-pieces. Bernard expertly utilizes the full array of French Impressionist film techniques to express the utter devastation and pointlessness of the war: dissolves and crossfades, hypnotic montage, crushing contrasts of the sacred and the profane, hellish land and cloudscapes captured from extreme angles, a world literally thrown off its axis by unimaginable suffering and destruction. It’s a film that starts with a mass of patriotic soldiers dissolving into an infinite sea of the eponymous wooden crosses. And it never lets up: through a platoon sitting on top of a German mine for five days (because no one will bother to order them to leave) to frontal assaults on dug in enemy positions to a late night defence of a village set in, naturally enough, a cemetery. We follow a dozen or so characters, mostly but not entirely from the perspective of a new recruit, a former law student who is younger and wealthier than his comrades. The film is their story, a collective of grunts used-up and blown away by their superiors as much as by the enemy. When Georg Wilhelm Pabst, one of the great German film directors of the silent era, known for such classics as Pandora’s Box and Diary of a Lost Girl, made his sound debut, he was sure to make it count. No quiet on this western front. That eerie whine of a falling bomb, followed by its destructive blast, dominates the soundtrack during battle scenes, making the terror of that sound and all it implies terribly felt. Something we’re used to from war movies by now, but incredibly impressive for a film made when film sound was a new invention. All the more so because they were recorded live, while Pabst shot the battlefield with tracking shots and static long takes. 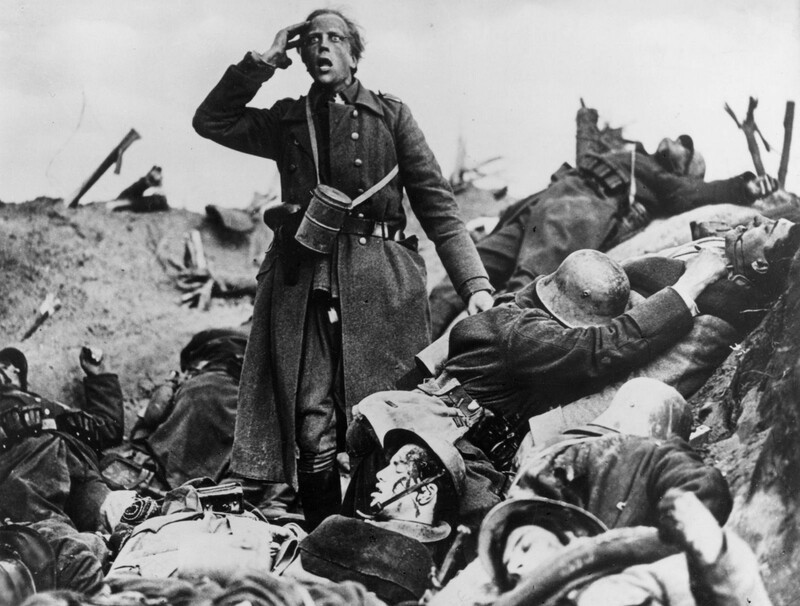 Westfront 1918 is kind of a German counterpart to All Quiet On The Western Front (1930), the American World War I film made in the same year that would go on to become much more famous. Both were based on German books written by veterans of the war, concerned with the effect of the war on a group of young men fighting at the front. Pabst takes on this, however, is less sentimental and more bleak, realistic and miserable. The four main characters somehow become less defined as the film progresses, ground up by the war machine like so many countless young men were in reality. All end up mad, dead or both. The horror of World War I, as portrayed here, has lost none its impact after all these years.